SHREE SHAKTI ENGINEERING is engage in manufacturing Hydraulic Press. 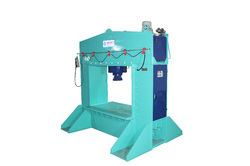 Our offered Hydraulic Press provide fast approach slow pressing and fast return speed. We are using high quality raw material. Our professional engineers team ensures that all the ongoing processes are carried out in conformity with industry set and norms. Our offered Hydraulic presses are used in various industries like bending, straightening, bush and bearing removal, press fitting and forming. The cylinder bodies are precisely made from forged steel material duly bored and fine honed for long sealing life and the piston rods are made from EN-8 material. Hydraulic system comes with pressure relief valve is provided to safe guard system and machine from overload. Use premium quality raw material.